As of today I'm getting messages from my Norton security that my system is infected. It states: System infected: Coinminer Activity 8. I've googled and read up on some stuff and found out that my system isn't infected because norton is blocking it (I think?!). However I would like to figure out where its coming from and if there is a way of fixing it. The last few days I didn't install any software. Actually, I was on holiday and no one has access to my computer. As you can see on the printscreen attached to this post it happens now and then and I can't find the solution or problem whats causing this issue. I did a full system scan and did a anti malware/ransomware scan and nothing was found. I'm using version: 22.14.2.13 on Windows 10. However I would like to figure out where its coming from and if there is a way of fixing it. Thanks for your posts. I'm not familiar with this site. Never been on it to my knowledge. Um, does "More Options" offer any more info. See attached images for the extra info from "more options"
Um, are the "intrusion attempts" ongoing ...? Yes, Norton keeps on giving me messages that it blocked the attempt. Every like 30 minutes or so. Have you cleared browser and system temporary files and cleared cookies and machine restart? Um, what other security programs now, before Norton? What you may be seeing are redirects from malformed ads on some web site you are viewing. If this is what is happening, nothing is being downloaded to your computer and the issue goes away when you close the browser tab that is involved. You might get relief from these warnings by installing an ad blocker extension in your browser. I used the windows anti virus (windows defender or something it was called?) and another one which I forgot the name of. This acces control entry is corrupt. Delete it and create a new one. I checked via CMD in Admin mode what files are in that specific folder and I found the following results: (look at the top 3 and bottom 3). Yeah, the IP <here> pointed to Microsoft. Sorry, we're over my pay grade. I submitted https://submit.symantec.com/false_positive/ ....but, don't know whether I submitted enough information. I'll update thread if n' when I hear back. I'll presume (for now) Ravaga Crypto Chart is legit app? - Tried unlocking the folders as in a previous post that contain anything that had to do with Coins or Crypto. The software told me that there was nothing to unlock but gave me the option to remove the folder. I did that. - Changed ownership back to origional state. I could not find any way possible to remove the folder in a "normal" way. Not via safe mode, not via CMD in admin mode. Only way I had succes was via the Unlocker software. I would still like to hear from you if you get a response from te Norton team. When you uninstall a desktop app (program), it will uninstall it for all users on the PC. When you uninstall a Windows app (ex: from Store), it will uninstall it for only your user account since each Microsoft account owns their own modern apps like a smart phone. There are options in the tutorial to uninstall Windows apps for all users and new users. Unfortunately, some of the default apps that Windows uses cannot be uninstalled. If you already uninstalled an app for your account, it also won't let you uninstall it for all users from within your account afterwards. Thanks for the post again. I vagely remember installing that Crypto Chart app so that should be why it was on my system. I indeed could not remove it any further without doing it "manually". As of now I didn't get any more messages from Norton telling me about the coinminer so I guess it is fixed. The unlocker/guide I used was found via: https://www.sitepoint.com/force-windows-delete-file/ Step 1 didn't work for me so I tried step 2 and that worked. 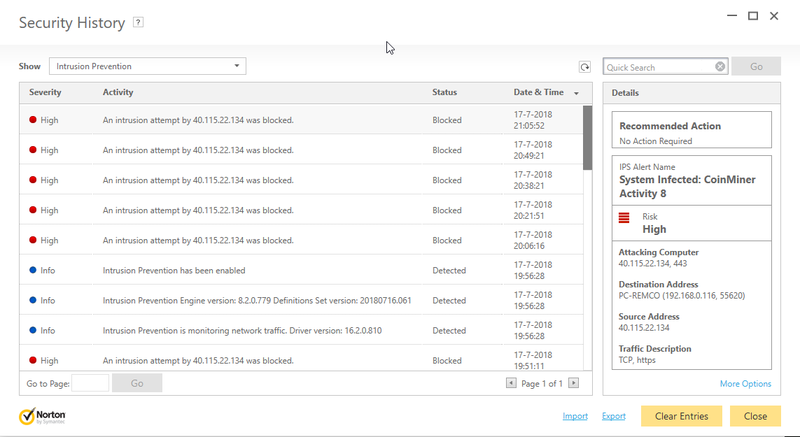 I am in the USA.... A few days ago I began being harassed by Norton 360 pop ups to keep warning me that Norton's 360 has blocked a Web attack - CSCoinminer Website. It tells me in "details" ... "no action is required"
It happens almost everywhere I browse now! It even happened when I entered this thread!!!! Its become annoying. Like swatting gnats and flies.... No sooner I click off the warning box, another one soon pops up. It happens both at home on my PC, and on my laptop at work. Started only about three days ago. Its why I am here. These attacks are usually from some malformed ads on a web site you are visiting. Nothing is downloaded and the issue goes away when you close that browser tab. You might be able to help stop these attacks by installing an ad blocker extension in your browser. I have done all that. Malwarebytes, and Norton's full scan. When I came back here to see your response the same thing just happened again HERE! Do you have any other browser tabs open while posting here? It is probably one of the other tabs that would be involved with the attacks. Clear your browser cache and restart the browser again. Then if you still see these attacks, try adding an ad blocker to your browser. I have an ad blocker... I clear my cache often. I can do as you say and it will make no difference. I just tried IE and noticed its not happening with it. I use Firefox as my main browser. I found the cause in my case. I use Firefox. It does not happen in the IE browser. So, I began a specific search in reference to Firefox. One add on I had - You Tube Best Video Downloader 2. I disabled it, and the Norton warnings stopped. genez: I am in the USA.... A few days ago I began being harassed by Norton 360 pop ups to keep warning me that Norton's 360 has blocked a Web attack - CSCoinminer Website. Please post screenshots like thread starter Remcove. Note: Remcove event appear related to Ravaga Crypto Chart. Thanks for the post again. I vaguely remember installing that Crypto Chart app so that should be why it was on my system. I indeed could not remove it any further without doing it "manually". As of now I didn't get any more messages from Norton telling me about the coinminer so I guess it is fixed. genez: I found the cause in my case. I use Firefox. It does not happen in the IE browser. So, I began a specific search in reference to Firefox. Yup! And, that video also helped me better understand a function of the uBlock software. In relation to submission 99567.